"Tangled Up!" is the story of two electric charges "Positive Charge" & "Negative Charge" who are paired by an electric string. One day the string that bonds them together gets tangled up! and they're unable to unite! This puzzle game is easy and fun to play, yet challenging to fully master. 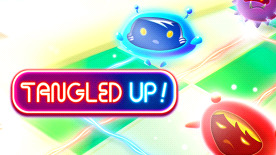 "Time chase" & "color match" are the two exciting modes of tangled up! which prove how smart you are.